Whitby's real estate market for residential properties has finally turned around a lengthy six-month trend in price declines. It did, however, also show an annual decline in price in November. This situation provides a unique opportunity for buyers and move-up sellers - homes in Whitby are somewhat underpriced compared to nearby communities Ajax and Pickering that have seen less price erosion from the market peak. 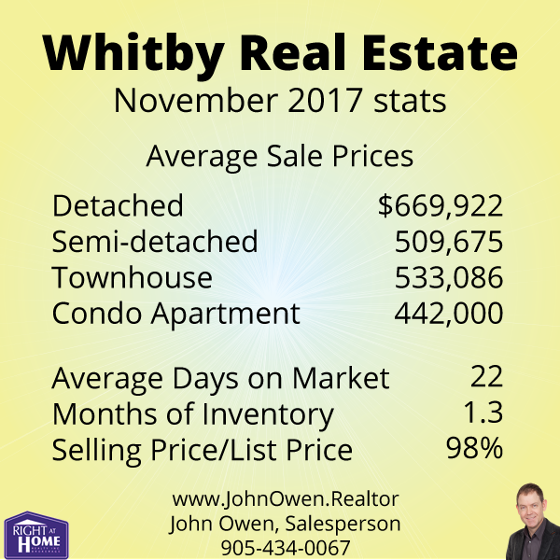 The Toronto Real Estate Board's (TREB) latest market stats put the average Whitby property selling at $615,8019 - down from last year's 624,409 by 1.4%, but slightly up from October's $615,599. The average selling price of homes in the GTA this November was $761,757. This represents a 1.9% drop since 2016. Sales volume fell 13.7%. Active listings in Whitby increased - 190.3%, which demonstrates a shift in market fundamentals. The rise in inventory helps to make the market more balanced - more inventory means less competition for listings by buyers, and less bidding wars. The MLS Home Price Index helps to normalize the statistics, by adjusting sales statistics to represent typical homes within MLS areas. 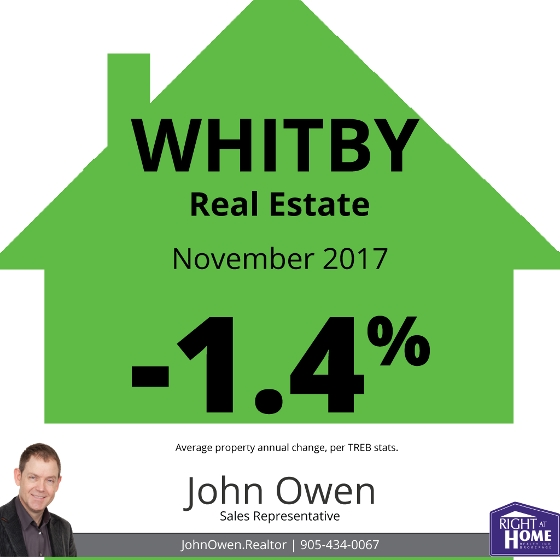 When using these numbers, Whitby showed a composite annual gain of 4.84%, compared to the TREB average of 8.41%. Inventory levels continue at low levels with 1.8 months of inventory on hand across the board. This means that a current sales levels, all of the property would be bought up in the GTA in 1.8 months (if no new listings were added). Overall, there is only 1.5 months inventory in the Durham area. In Whitby, there are 1.3 months of inventory. The average listing in Whitby spent 22 days on the market. The TREB average was 24 days. The average listing sold for 98% of asking, again demonstrating that demand is still strong, though multiple offers are not happening on the majority of listings. It is down from April, where this figure was 113%.